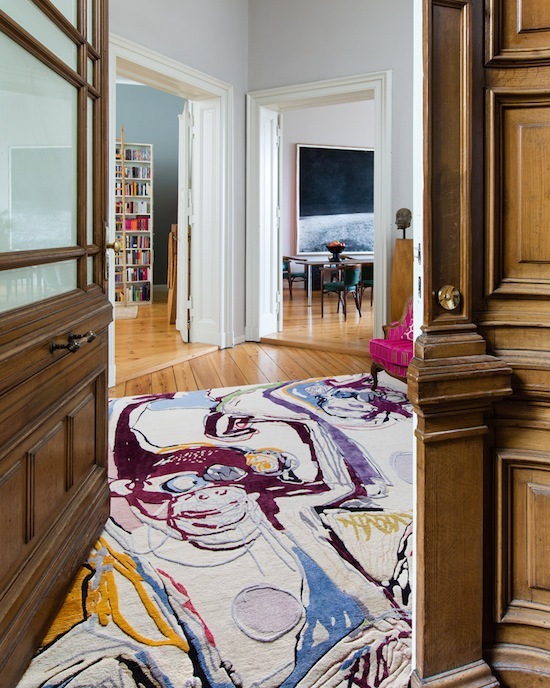 Platitudes have already been written about Rug Star, its outgoing and buoyant bon vivant founder Jürgen Dahlmanns, and the critically acclaimed and award winning carpets which bear the individually hand signed ‘Certificates of Authenticity’ of this now iconic carpet house. To belabour and restate any of his accolades would be to do a disservice to a man who, not unlike myself, sees the world through an intellectual eye that imparts a high degree of emotional context to his work. Unlike The Ruggist however, Mr. Dahlmanns enjoys several of the the benefits of his Teutonic origins. Brevity and efficiency drive his creative process, distilling the inspiration(s), the emotion(s), the reason(s) for being into concise and well formed carpet designs that, while still conveying the notion that ‘Beauty is Beauty’ do so without being overly heady. Punctuality is another trait for which all Germans are known, and sadly one The Ruggist, while appreciating when the train runs precisely as scheduled, is wont to forgo, in its stead favouring my own region’s far more casual approach to punctuality. It is under these circumstances of clashing ideas of ‘on time’ that after several years of email correspondence, I had the distinct pleasure of formally meeting Jürgen Dahlmanns, his staff, friends, customers, former lovers, and the like. Join me now as I get intimate with Jürgen! Even after joking just the day before about the need to be punctual when meeting a German, I found myself twenty (20) minutes late to my interview with Jürgen. ‘You are late. We had an appointment at nine (9)’ he begins in a tone that is an endearing blend of statement, mild displeasure, and concern. The impression of concern sticks with me most as I can tell Jürgen was genuinely excited to be talking with me about his carpets, and now, perhaps due to time limitations, may not be able to. ‘I’m very sorry’ I begin with no reason other than a laissez faire attitude toward punctuality as my defence. A few more quick exchanges of formal pleasantries to discuss scheduling and the imaginary crisis is averted. We’ll talk, I’ll observe clients, we’ll talk further later in the show. Done! ‘I built a world from this wreckage.’ – Friedrich Nietzsche, Dithyrambs of Dionysus. ‘So, ask me a question!’ Jürgen says with an imperative tone. ‘There are no real questions’ I reply. ‘I like to listen and observe, let you tell me what you want to tell me, but if you insist.’ I say coyly as I hit him with one of my few prepared questions. ‘You trained as an Architect, yet here you are as a very successful rug designer, how did that happen?’ We’re standing in front of a carpet from his ‘Embrace Me’ series which he has just explained is a ‘study in self-reflection and the beauty of destruction, contrasting beauty and destruction’. Jürgen further cautions ‘we must be careful’ when exploring the relationship between the two (2), he said partially referring to the carpet, but also philosophically to life. ‘When I was a young man I was in this relationship that ended with the death of my former lover due to HIV.’ he says, as note taking on my part suddenly becomes far less important. ‘We were together throughout my twenties and during the time I was studying to become an Architect. He died around the time I became an Architect and though I was young and successful, managing large projects such as the Vienna MuseumsQuartier, I was not fully happy. How could I honour his life, if I was not living a life I was happy with?’ he asks in a slightly rhetorical manner. So it was that at the age of thirty-five (35), four (4) years after the death of his love and at the beginning of a promising career as an Architect, Jürgen changed his life and turned his apparently boundless energy toward carpets. Several seconds of silence now pass in that slight awkwardness of conversation when suddenly Jürgen says ‘I have to pee!’ and so needing to urinate myself, err rather, also needing to urinate, I say ‘I’ll join you.’ as we continue talking and joking as we walk through the halls. ‘What do you think of these carpets?’ he asks me as we approach another stand. Wondering if he is ‘testing’ me, I explain my like of the carpets via some eloquently nuanced statement that attempts to mask my love/hate relationship with the marketing of high end, luxury, upmarket wares. Jürgen interjects, condensing my ramblings, ‘Don’t sell status, sell beauty.’ I nod in agreement exclaiming ‘Exactly! !’ as if we’ve both just discovered air. Languishing on a single subject or taking a long time on a given task are not personality traits of Mr. Dahlmanns. This becomes apparent as we’re walking and talking, jumping topic to topic, discussing how the aforementioned Daniil – who designed the Rug Star ‘Heart’ Rug – had taken much longer to colour the ‘Eco’ version of it than perhaps Jürgen would have done himself. ‘I like to do things, get them done, and move on.’ he says. 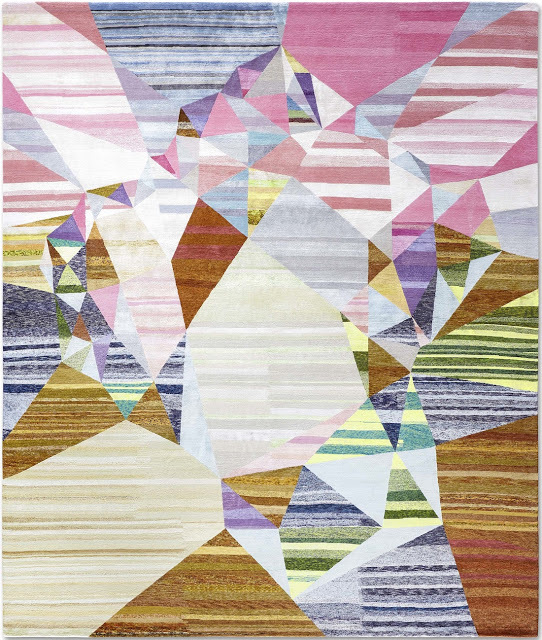 ‘Heart’ which won the ‘Best Modern Design Deluxe’ Carpet Design Award in 2015 is the key motif of the the concept ‘God is abstract.’ Geometric shapes represent the main themes of life, with the ‘Heart’ rug symbolizing the pursuit of love; a concept Jürgen holds most dear. ‘All is love.’ he says as our excursion ends and we return to his stand. ‘One day I will be a father.’ he says, again reminding me that he will soon be fifty (50). ‘Now that I have once again found love, I think about being a family, about having a child.’ I interrupt him for moment to ask some cursory details about his new love, sensing in him – or perhaps projecting – the same interest in younger men I possess. ‘How old is he?’ I ask, and then in rebuttal to his reply conclude ‘Good for you! !’ with a wink and a pat on the shoulder. At this point I am a little lost for words said The Ruggist never, and so I’ll pretend to resort to the only question left in my prepared repertoire: ‘So is this desire for family, and enduring values, and love what inspired you to produce this new photography series ‘Intimacy Berlin’? ‘Oh yes!’ Jürgen begins, ‘I wanted to show carpets in real homes, with people’s real things. We visit the homes of friends [whom he later adds have been most generous in allowing him into their homes and for whom he is very grateful] and I get an idea of which carpets I would like to use in their home. We then arrange for the shoot, show up and for one day take over their house. I forbid my friends from cleaning before we arrive. You get to know a lot about people when you have to handle their dirty laundry.’ he says in a literal sense, but also with the tacit acknowledgment of his philosophical good/evil, learn from your experiences approach to life. Everything about the ‘Intimacy Berlin’ series is appealing to me. 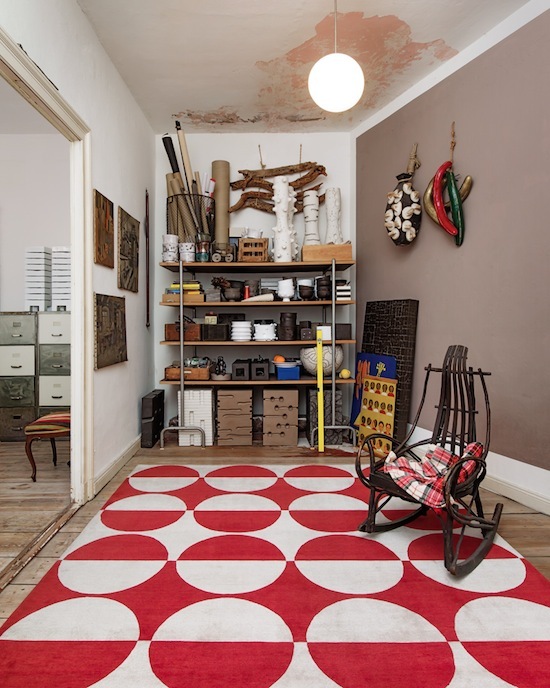 Real authentic places – as much as those exist, used to showcase the exceptional range of work of a true carpet addict, set in a city I fondly love, with a range of objets d’art and tchotchke suitably eccentric enough to endear even the most die hard critic. Beyond the haughty philosophical mumbo jumbo however is the decidedly – though not original – beneficial sales aspect. 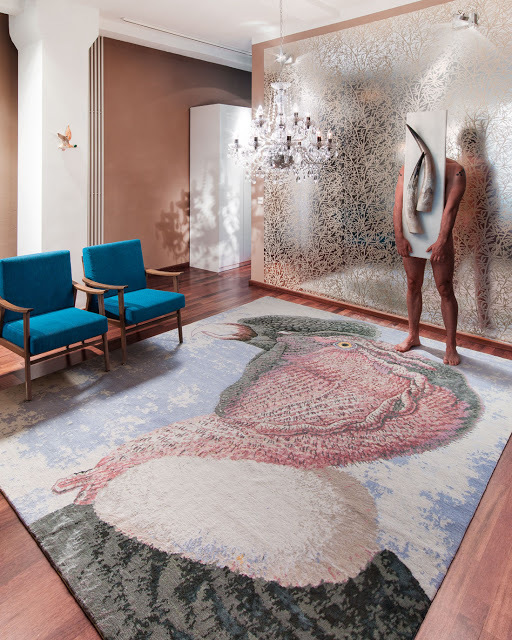 By amassing a comprehensive collection of in situ images of his carpets, styled by the man himself, Rug Star is creating a wonderful sales tool to compliment the quality of his carpets. No longer must a would be client (or their designer) need wonder if a Rug Star carpet is right for them. When they can see a variety of spaces, some of which may resonate very personally with them and their family, they are better able to realize that the crazy ‘Big Bird Head’ (with or without naked Jürgen) might just actually be for them. Whether this photography is used in direct advertising, as showroom sales materials, or as fodder for a future monograph, the benefits are certainly apparent. ‘You can question my designs, but you cannot question the quality.’ he says as we look more closely at the carpet. It’s hand soft and inviting. ‘I make the product, that is my part.’ The rest of course is up to consumers, clients, friends and family and anyone with an appreciation for Jürgen’s work to buy into his ideals and aesthetic. They must also further realize that handicraft is not just about making recherché luxury items for western families to have, but also about providing a way for eastern families to simply be. ‘All is love’ and we’re all in this together. The Ruggist wishes to personally thank Herr Jürgen Dahlmanns for his time during DOMOTEX and for providing ‘Eden Big Bird Head’ w/Naked Jürgen for exclusive premier here on The Ruggist. Special thanks to Rug Star’s staff for their quick and timely assistance with photography. 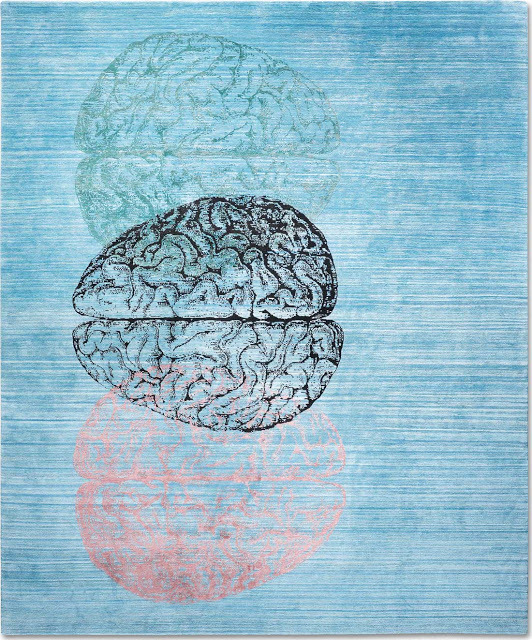 – All images courtesy of Rug Star by Jürgen Dahlmanns. Previous Post:Domotex Carpet Design Awards 2016 Un-Official Selections!